This is Campi, the International Epilepsy Day mascot. Campi is a cute little seahorse who happens to have epilepsy. He is very gentle and kind and sometimes he is a little shy. Everyone is his friend. Our first video shows Campi at school with his friends Cala and Tuno and their teacher Mr W Hale. Cala loves ‘girlie’ things and having all those arms (tentacles) means that she has lots of room for wearing sparkling bracelets! Tuno is a bit of a tomboy – or maybe that should be tom-tuna! But he’s a bit of a softie behind all the bravado. In our second video Campi goes with his mum and dad to visit Dr. Cristina Langoustina to find out why he has been unwell recently. So, you might ask, why did we choose a seahorse? We wanted to have a character that had a connection to epilepsy in some way and Campi just happened to fit the bill. The seahorse is genus Hippocampus and its shape resembles a part of the brain that has the same name and is important in producing seizures and epilepsy. It’s also an animal that people find fascinating, graceful and beautiful. 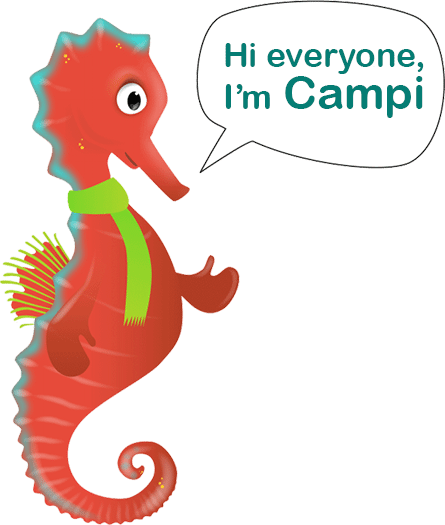 We hope that you will enjoy meeting Campi and his friends. Campi, the seahorse, along with his mum and dad, visit Dr. Cristina Langoustina to find out why Campi has been unwell recently. In this episode Suzie Squid visits the school from the local epilepsy association. Suzie shows Campi and his what and what not to do if someone experiences a seizure. Download the colouring page for this video. Why not draw the safety gear on Stella’s screen? Please Note: If you would like to provide captions for the above video in your language please email internationalepilepsyday(at)gmail.com.